Thailand Ministry of Culture signed to appoint lawful National Cultural Council of Thailand in the United States at Fremont, California. In March 2013, the Wat Buddhanusorn committee has requested to establish the Thai Cultural Council in the United States from the Department of Thailand’s Ministry of Culture. The temple committee has requested for two networks registration first, which were the Cultural Council of Wat Buddhanusorn; and the Parents and School Alumni of Wat Buddhanusorn. Then, the temple committee requested to register those two networks to become the Thai Cultural Council. On October 7, 2013, Mr. Chai Nakornchai, rector of the Department of Cultural Promotion, Thailand has approved the Thai Cultural Council of Fremont to be transformed into the lawful National Cultural Council of Thailand Ordinance BE 2553, Section 17 in the United States by giving a title, “The Cultural Council, Fremont, USA (see approved letter). 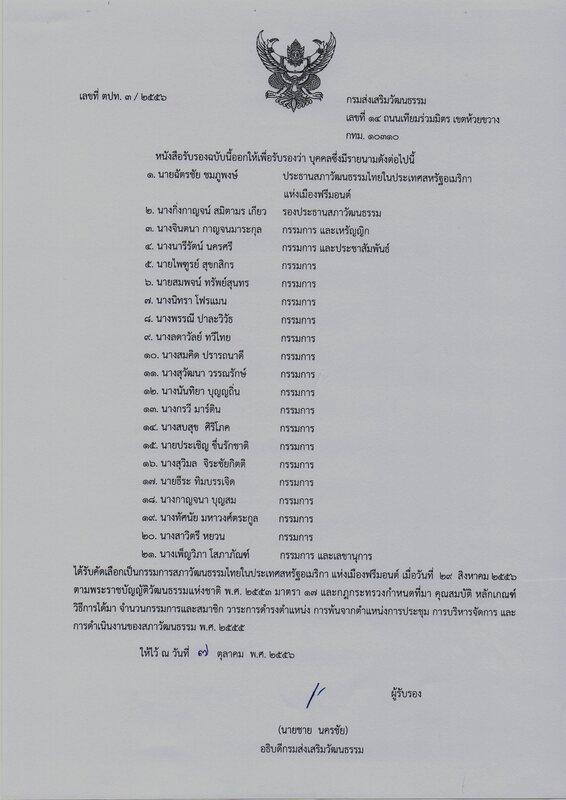 Approved by Thailand’s Department of Cultural Promotion, including the 21 members are as follows.